Let’s say you’re playing live blackjack online, you have a confirmed bet on the table of $50, you are dealt Q,4 for 14 against the dealers 10 up-card. Before getting a chance to play your hand your cat chews through the power chord on your high speed router and boom – your Internet connection’s gone (as well as your cat!). What happens to your $50? Playing an RNG blackjack game, the casino can simply return you to the exact point in the game where you were disconnected when you re-connect to the games server. The deal is virtual and pausing/restarting it is not a problem. A live game with actual cards being dealt by a real dealer by contrast can’t be paused. Can you imagine the dealer asking all the other players at the blackjack table to wait while you re-establish your connection, continuing the deal only once you have joined the table again? Ain’t going to happen. A live deal waits for nobody. This makes disconnection policies at live casinos very important, particularly in the case of blackjack. They are less crucial for live roulette and live baccarat where no player decisions are required after the point where bets are accepted. Other than the inconvenience of not seeing your bet outcome in real-time you aren’t really affected. The fact remains however… it is worth knowing the disconnection policy at your favourite casino. “What happens if I get disconnected during a game? Returning to our opening blackjack scenario, your opportunity to take the basic strategy play is lost and your hand is defaulted to stand on 14. Clearly this policy hurts you on any occasion where you are disconnected and the optimal play given yours and the dealers hand is to hit, split or double down rather than stand. If you are disconnected from the Internet in the middle of a game while playing for Real Money, please re-establish your Internet connection and log back into the casino. You will be automatically directed to the non-live version of the game you were playing so you can finish the game round. Please note that only the cards that were on the table at the moment of disconnection are carried over to such a game round. 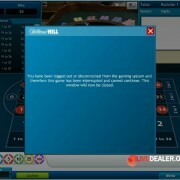 In some cases the video stream may allow you to see dealer cards drawn or revealed after your disconnection. These cards are not carried over to the non-live game round. Returning to our opening blackjack scenario, after logging back into the casino you will be directed to an RNG blackjack game where you can hit your 14. In any case where a disconnection occurs at a point where your optimal play is to hit, double down or split then you will get your opportunity to do so and aren’t disadvantaged by the disconnection. The fact that Playtech have an advanced RNG suite of games gives them a leg up on Evolution Gaming with regard to their ability to deal with disconnections in this way. Evolution Gaming aren’t able to offer this same option because they don’t develop RNG games as well as live games. If you become disconnected while playing a “Live Casino Game” your bet will be cancelled if the game has not yet reached the “NO MORE BETS” stage. If the game has passed “NO MORE BETS” when disconnection is detected, your bets will remain in play but you will be unable to make further decisions on the hand. The game will proceed and will take the default action as if you had played but had taken no action at any game stages allowing customer decisions. After reconnecting, you should review your Games History Report, to determine the outcome of the game. This is similar to the Evolution Gaming policy…you get the default play and win or lose based on this play. However at Vuetec there’s a small twist. And it’s not a bad one to be honest. 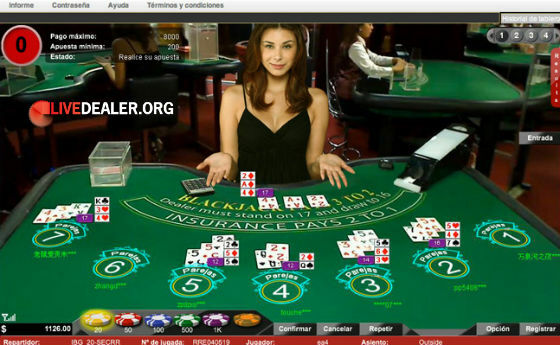 Vuetec’s live blackjack game is a significant departure from standard blackjack. You can read about how Basic Strategy Blackjack with Early Payout works here but the upshot is, the default play at each stage of the deal is the applicable basic strategy play – not simply “stand”. So while you don’t get to see the game outcome as it happens (or choose the optional early payout), you will get an optimal play outcome. Returning to our opening blackjack scenario, while you are disconnected from the game server, your 14 will automatically be hit. When you manage to re-connect you can see if you managed to get lucky on the hit (s) or whether you lost the hand in your game history. Unfortunately however, at all 3 casinos the ‘Disconnection and Cancellation Policy’ was nowhere to be found. If any reps from these casinos drop by perhaps they can shed some light on where (and what) this policy is. It is worth noting that these casinos offer a blackjack variation that prompts the basic strategy play and takes this play as the default so even if your bets stand after disconnection you will get the optimal blackjack plays. “What if I disconnect from the Live Dealer Casino during a session of play? Returning to our opening blackjack scenario you will stand on 14. As for disconnections at Evolution Gaming casinos you are denied the opportunity to hit, split or double down where these are the optimal plays. Is it just me or does this read like a Chinese to English Google-translate? It is surprisingly ambiguous for one of the biggest casino software developers in the world and certainly doesn’t answer the question as to whether the default action applied to a disconnected player’s hand is “stand”. Although I assume this would be the case. Closing comment – how often do disconnections occur? Ultimately this depends on the quality of your connection obviously. But in my experience, which amounts to well over a thousand hours playing at various live casinos on many different types of connections including cafe wi-fi, they are rare. And disconnections at that crucial point after your bet is confirmed but before you’ve played your hand while playing live blackjack…rarer still. I cannot recall an occasion when this has happened to me. The more common experience is loss of video footage and having to play the game out watching the computer graphic representation of the game. Still…it never hurts to know just in case! i got stung yesterday the connection feed froze but i could see what total i had but not what cards or what the other players had, i asked the dealer 3 times to tell me but the dealers english is very limited and she didnt respond. I had 12 the dealer had 10 for all i know it could of been two aces and i could of split so i just played it safe hit twice getting a total of 17 if i’d hit again i would had the 4 the dealer got hitting 21, probably saving the table (me being the last player on the table) not knowing what cards the other players had i couldn’t take the risk hitting on 17, not even a free bet however paddy power say its not there fault and theres nothing they can do about it. Fed up with the big names getting away with it because theres not a lot the customer can do! I do feel your frustration – and hope you didn’t have too much riding the hand. For what it’s worth (and assuming you didn’t have A,A) standing 17 was the basic strategy play. But that’s irrelevant…you want to be able to play the game in the manner you choose AND be involved as it unfolds. Paddy’s are Evolution Gaming powered (see their above disconnection policy) and so in the event that you are unable to hit/split/double due to connection issues you are deemed to stand and your bet applies. And they’re (Paddy Power) right to the extent that it’s out of their hand – the games are being served to you by Evolution Gaming…still all this is cold comfort when stuff like this happens. Sometimes the squeaky wheel gets a bit of oil!